I knew Au Sonam since my days in Gaupay, way back in mid 90s. He was a terror. He lived outside our school gate with his father and stepmother. His muscular body, complimented by fluent English made him a fearful star in the neighbourhood. He was always high on his substances and would be surrounded by bunch of bad boys from our school. Every little problem in school will reach him and he won't hesitate getting into our campus and solving it his way. Once even I was on his hit list. Someone went to the godfather and he came looking for me. I was in the dinning hall over lunch. It was like a typical scene from Bollywood movies, where the villain comes to the college and nobody says anything. Even the teachers won't want to mess with him, so there I was on my own. He found me out and to my surprise he said, "Jada, he is just a kid. Give me some big guys." After that day I, like hundred other avoided being seen by him. Over the years, I have seen him in Thimphu, Paro and Phuntsholing, always alone and high, swaying from one end of the road to other. There weren't many people, even from across the border who dared offend him, let alone Bhutanese. With Au Sonam (Center) After so many years here he was, as our honourable guest speaker at the Royal Academy. Well dressed, well spoken, very committed and very open with his thoughts. He was invited to speak to us about his life and to give us insight into the minds of addicts. He is now one of the successful recovering addicts who is doing everything to help those who are headed into the direction he once was. He said he hated his stepmother, and went on to give her hard times after he grew up. She passed away and his father also left him few year later. He got married and gave his wife hard times too, and she left him. He became father and never justified his role as father. Everybody closed their doors on him. He slept on streets, begged from friends. He went behind the bars several times. He wanted to stop everything and live a normal life but it was no more in his hands. He relapsed several times, and in his low days he got beaten by his rival gangs. Once when he had his withdrawals he had walked from Paro to Haa and his relative there sent him away with Nu.100. On his way back he hallucinated and jumped of a taxi. The driver left his bag on his still body and drove away. He said that's when he hit the 'Rock Bottom', the time in life where you turn around and see nobody and nothing. You are alone in the world. He said the pain of addiction is not the beating you get from gangs and cops, it's not the pain from hunger and cold, it's the not the pain from the withdrawals. The real pain is realising that all the doors are closed on you. That's what he called the rockbottom. There is now one important decision to make- to leave or to live. And he decided to live. Now here he is clean and a respectable man, though still fighting his personal battle with his past and its implications. He vividly remembers those last individuals who opened their doors for him and he is striving to do the same for those in need. 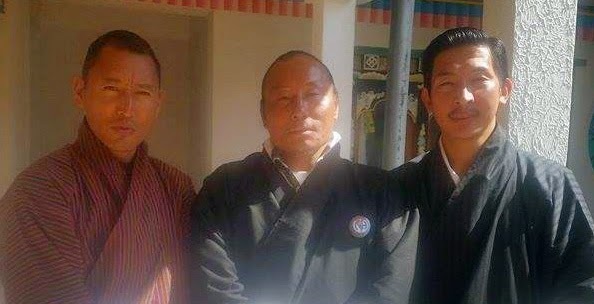 He is working with Chithuen Phendhey Association in Paro. Of all the people I never thought he would make it, he is an inspiration. The one regret that he says will always haunt him is his misinterpretation of his stepmother. He realized that the problem was never with her, she had tried her best. She raised him. But he lived with the stereotypical notion of stepmother, which never allowed him to understand her and love her. He admits that any mother would kick son like him out, but she didn't. He wants to say sorry and hug her and thank her for trying so hard but he has waited too long. NOTE: His office in Paro has established a Pre-Rehab centre at Shari, the place where they keep their clients before finding a suitable place and funding. And he is looking for some recreational tools, like books, carom board and computer to keep them occupied. If you wish to donate please come forward. People like him really are such an inspiration. Knowing that someone can still bounce back to normal life after all those, it gives us a hope and that keeps us from giving up on those who are trending the path of substance abuse. Please write to me with details of what Sonam does at this Pre-Rehab. Perhaps I can contribute in some small ways, both personally and through my institution. Au Yeshey, I will get back to you with some details. Thanks for your support. He really needs some. Chador, Pass the books to me, I will make it happen.